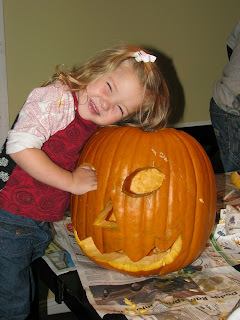 Last Monday we decided to carve pumpkins for FHE. Both the kids were really excited and kept asking all day when it would be time. Doug helped them for the most part but somehow I managed to be the one in the photos. Bella was excited up until I told her to put her hand inside and pull out the guts. She looked inside and then looked at me like I was crazy. Eventually she started to pull them out but kept this disgusted look on her face like she couldn't believe what she was doing. As you can see by the above photo I was trying to act as excited as possible to keep her digging. 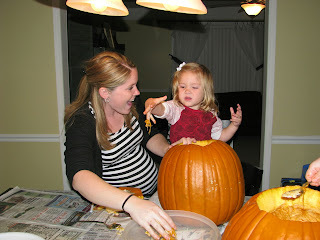 Once all the guts were out and we were done carving, she was pretty dang proud of her pumpkin. She kept saying it was scary! 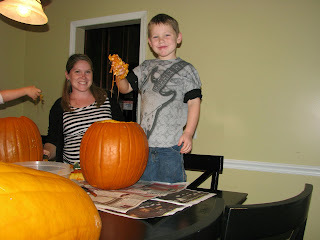 Now, Isaac on the other hand loved the feeling of the pumpkin guts. 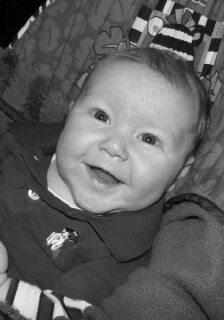 He was all smiles the entire time. After he was finished he helped his Dad draw a scary face to carve. 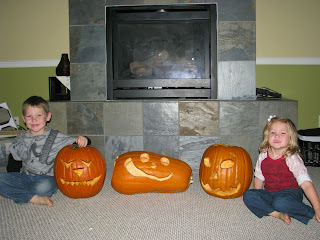 Doug helped Isaac with is scary pumpkin, but also took the time to carve the middle goofy one for little unborn Carter. After carving we set them in front of the fire place, lit some candles and turned the lights off. This was the first year that we didn't use those fancy stencils to carve pumpkins (you know with the haunted houses or flying witches). Turned out to be lots of fun letting the kids use their own imaginations (mixed with mom and dads of course). Okay, so those of you who do not know my sisters or check their blogs- there is a war going on. Not too long ago my eldest sister Tonia (the one in the yellow shirt) snuck into my sister Trina's blog and posted her age for all to see. Trina promised to get Tonia back one day. Well Friday night Trina & my other sister Kristin attended a church Halloween party dressed up as 80's chicks. After Trina posted these pictures on her blog I posted a comment explaining that they "did Tonia proud". 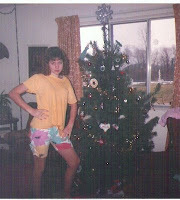 Tonia was the only one I remember dressing even slightly with 80's style. Well Tonia thought that was funny and said that she dressed "much, much cooler" then them. In retaliation to that comment, Trina posted the above picture of Tonia (in yellow) on her blog and is now taking votes. Who looks "much, much cooler"- Tonia or Trina & Kristin? So please take a little time to visit Trina's blog and cast your vote! Thanks!!! Dougs grandparents were able to come to Michigan from Arizona for a 5 day visit. We don't get to see them very often so it was really nice to spend a little time with them. Doug, his brothers, and his dad all decided to take Grandpa George out on a "man adventure". George is an avid hunter... even more so then Doug; so Doug found a place for them to go goose hunting. Although this adventure began for Doug at 2am in the morning (and they got rained on quite a bit), he had a great time and said he's glad he was able to learn more about it. Check out this little video that Doug's brother Jerry put together of their trip. Just copy and paste this to your blog and highlight or Bold the ones that you HAVE done. Monday the 20th at 11:50pm my newest neice made her debut. 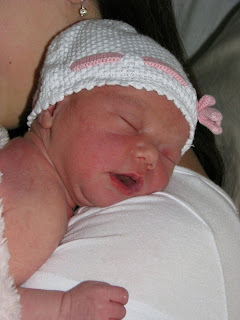 Emily Grace weighed 6 pounds 12 ounces and was 19 and half inches long. She's so tiny and beautiful! I went to the hospital on Tuesday afternoon to visit her and Rachael & Brian (also to take several pictures for Rachael). When I held her my heart melted. It made me so anxious to meet my little Carter! Rachael and I have been on this journey together neck and neck. I found out I was pregnant just days after she did, we were both horribly sick at the same time and put on Zofran, we found out the gender of our babies on the same day, and shared some maternity belly portraits together as well. 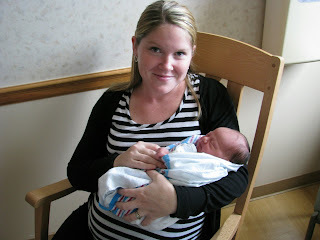 Rachael was due 2 weeks ahead of me, so I knew her little one would more then likely arrive before mine. I guess now it is really becoming real for me that my turn is just around the corner. Exciting! Well I am extremely happy to report that exactly 2 weeks after buying the first Twilight book- I finished them all!!! Late last night the best feeling was to read that final page of Breaking Dawn which simply read "The End". Although I thoroughly enjoyed reading every single book I am so psyched to get focused and jump back into reality. I'm only due in 4 weeks!!! So seeing as how I was finally hitting the "nesting" mode yesterday, we decided to set up the crib and bassinette as well. Washing all of Carters bedding and clothing. Now I need to pack! I have done this twice now but of course am always wanting to know what worked best for everyone else. So if you could; before I begin this packing journey- tell me what items you wish you would have brought to the hospital or what items you absolutley loved having. Thanks! Oh, isn't this photo so sweet? The title of this post is "In Our Arms". When will we be holding little Carter in our arms? It's so fun to hear and record everyone's guesses on the arrival of our little ones. I'll have to go back and check to see who was the closest with Isaac & Bella and post that another day. Today, however I'd like to start reading what you think. I will be 35 weeks tomorrow and a "full term" pregnancy is technically at 37 weeks. So this little guy could arrive anytime between October 23rd and November 27th. (Oh yes- big gap I know, but he very well could be two weeks late. I want him to come on his own time and will not ask to be induced until that date). For your guesses I'd like to know the following: Date of arrival, time of arrival, weight, and length. To assist you in your guessing I suppose I should remind you of my last two children. Bella was due on April 4th. 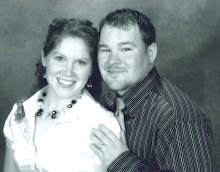 I didnt' set foot in the hospital with her until the wee morning hours of April 9th (Sunday). She was born 6 hours later at 8:14am weighing 8 pounds 14 ounces and was 20 inches long. So there you have it- one child was a month early and the other was almost a week late! I'm clueless on this one's arrival. The contractions come and go but nothing consistent. Okay- so here's where your conscience comes into the picture. I want you to make your guess before clicking on the comments to see everyone elses. Write yours down and then go and post it under the comments. Don't change it once you see the others! Well.... it happened. 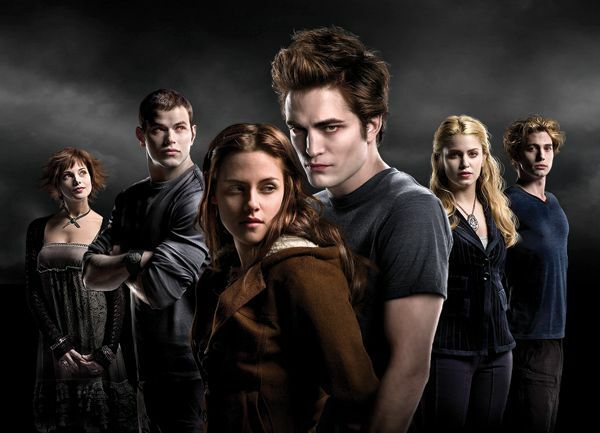 I fell into the trap and am officially in love with the Twilight Series. I once was one of those people who laughed and made fun of the crazy "vampire" lovers and yet now I have become one. The majority of the girls on my Norton side have been raving about this series the past few months. When I found out that our "Norton Girls Night" in November would be to see the new movie "Twilight" I figured I better at least read the first book so I wasn't lost. So I purchased the paperback at Target for $8 last Thursday at about 2pm. I finished it the next day at 10pm!!! I couldn't put the thing down- it was insane. I wanted to read the 2nd one right away but knew I could patient and hold out... that is until late Friday night I discovered the "preview chapter" for the next book. After I read that I was doomed- Saturday afternoon I was at Walmart purchasing New Moon. I paced myself better with that one though- just recently finishing it yesterday. Now I'm trying to be patient and wait for my mother in law to bring me the 3rd and 4th books on Thursday. This is the first day in a week that I haven't read the Twilight Series! Sad huh? Well I must say looking at the picture for the new movie has me ecstatic to watch it. Little Carter better come out long before the movie or wait until after it arrives because I have every intention of sitting in the theater on opening night!!! Go ahead and laugh all you haters- but pick up the book once and I promise you'll fall in too!